Almost seven years ago, I ventured into the hot topic of veiling. As I quickly found, there is quite the cyber skirmish going on concerning this topic as well as the issue of what constitutes modesty. As with many devotions and other disciplines, discussion can get quite contentious. In my post, Devotion: Lifting the Veil…Onto My Head, I shared what had precipitated my decision to veil. My research found many differing views expressed by other writers, requiring a bit of digging in an attempt to answer the first burning question. 2. Men, in a church or outside a church, while they are assisting at sacred rites, shall be bare-headed, unless the approved mores of the people or peculiar circumstances of things determine otherwise; women, however, shall have a covered head and be modestly dressed, especially when they approach the table of the Lord. When the 1983 Code of Canon Law was promulgated this canon was not re-issued; indeed, canon 6, 1, abrogated it, along with every other canon of the 1917 Code not intentionally incorporated into the new legislation. (4) other universal disciplinary laws dealing with a matter which is regulated ex integro by this Code. Thus, any canonical obligation for women to wear a head-covering was eliminated. Laws, which were part of the 1917 Code (including canon 1262) lost their force. Therefore, their legal requirement officially ended. You may further notice that, veiling in particular, was never specified – just a general covering of the head and modest dress. 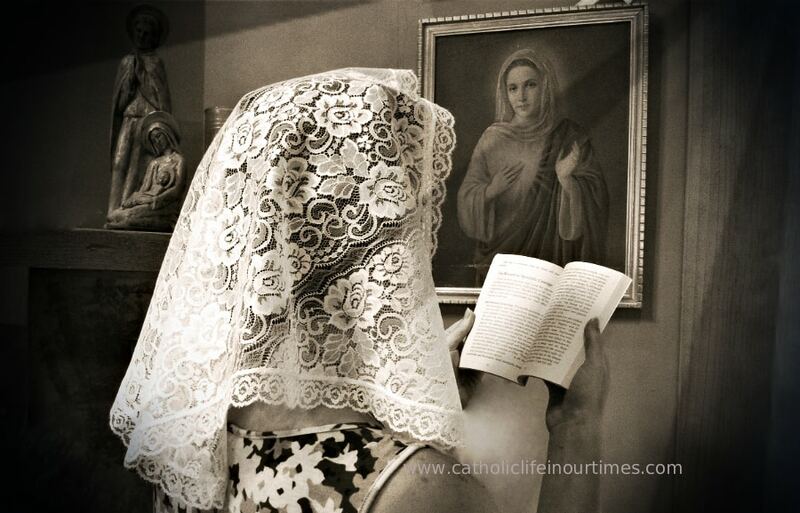 Is Wearing a Veil Still Desired by Catholic Women? Finally, after searching and reading multiple sources, I concluded that wearing a veil is a discipline (not Dogma) and therefore optional. Something interesting resulted from my searching, however. There seemed to be a trend of admiration and even encouragement for veiling on the part of many in the clergy. I saw this repeated in my own experience, as well as anecdotally from others. Take the visiting priest from India who, due to a bit of a language barrier simply pointed to my veil after Mass and gave me a smiling thumbs up. Another favorable comment came from a deacon who had read my original post. He wrote about his thoughts that “in a culture in deep decline, and after having discussed this with a variety of priest friends, I have come to believe that the veil is one of very few symbols that manages to say something good and positive about the dignity of the Christian woman (and girl). It really warms my heart“. To those who fear that veiling is sort of a ‘look at me’ exhibitionism, let me just share my experience with you. As only one of two women who veil at my small rural parish (my grown daughter being the other), I can assure you that this practice is more humbling than it is a practice of conceit. Further I don’t veil for exterior motives. I veil for the interior. For me veiling is about getting my mind focused on unity with Jesus. It is about showing Him that I have come to be His as He is mine. Veiling gives me a curtain, so to speak, allowing a certain amount of intimacy that closes out the busyness surrounding me at the Novus Ordo parish we attend. Along with resting my face in my hands after Holy Communion, my veil provides a private place to commune with the Savior Who I have just received. Of course, there is differing opinion and reporting concerning the meaning of the Canon Law cited above. In order to solidify the topic in my own mind, I went to sources known to be solid in their grasp of Catholicity. In his post, Do Women Need to Wear Head Coverings at Mass, Jimmy Akin pointed out, for example, that “given the natural expectations of many people at Extraordinary Form Masses, one can see a certain appropriateness to wearing them in that context“. For emphasis he references a letter written by Cardinal Burke addressing this very topic. Since he is often asked about veiling Fr. Zuhlsdorf commented, “I think this is a good custom. It recommends itself on many levels, some of which are, frankly, obvious“. In another post, he continues, “My view is that this custom should be revived. According to the Church’s present law, women are not obliged to cover their heads in church. I would be pleased if they did, but… hey…” In an effort to get out of the lively conversation that ensues after the topic of veiling is raised, Fr. Z promptly linked to a post from Conversion Diary about a woman’s first experience with veiling. So What’s the Bottom Line on Veiling? From what research has shown, and my own discernment, my personal conclusion is that wearing a veil is a beautiful practice for those of us who feel called to it. That veiling is optional should quell any feelings of inadequacy or pressure on those who are not so inclined. I personally find a peace and deeper ability to quiet my mind for prayer when I veil. Yet, that is my own experience. Others may not have the same inclination or result. All in all, the Lord wants our undivided attention. He wants our respect and love. The manner in which we are best able to give Him the worship, praise and adoration due Him, will no doubt lead to a more fulfilling faith life. There are many black and white issues concerning Church teaching – Dogma – we are obligated to follow. Veiling, however, is not Dogma but an optional discipline. As our faith evolves we may change these optional practices from time to time. After all, a faith standing still is a faith in decline. So I leave you with this thought: veil if you feel called and do not worry about the perception of others. If you do not feel called to veil, dismiss any concern you have about the perception of others. Veiling is a practice that is, at its best, a call that we willingly answer – all with our own reasons and inspiration. To God the glory! As a convert, I have been curious as to why no one at RCIA has mentioned the veil or the Rosary. I understand the concept of the veil and would like to feel more welcome to try it. For now, I have two and I wear one when I pray at home. It is a start. Women covering their heads is a long held tradition in the Church. Once, it was considered mandatory, now we simply have the option. It is a wonderful devotion to those of us who are called. Yet, others often misunderstand. There was simply no catechisis done at the time of the change. If you follow the other posts I have shared, you will see that I took my time in discerning. Yet, the call kept coming – in little nudges and friends met. I’ll pray, that you will find what is right for you. When that happens, let no one discourage you – one way or the other. God bless!